Anna Bolton | Greene County News Dr. Ereljorn Nelson, professor of clinical pharmacology and systems physiology, examines records Jan. 30 during a break in testimony. Two women share a word as Assistant Prosecutors David Morrison and Cheri Stout and Defense Attorney Peter Certo approach Judge Stephen Wolaver during the trial. XENIA — An independent medical doctor called the results of a blood alcohol test a “false positive” Jan. 30, the third day of an aggravated vehicular homicide trial in Greene County Common Pleas Court. Attorney Peter Certo is defending Kathy Smith, the 65-year-old Xenia woman who is on trial this week following a two-car crash that killed Bowersville resident Raymond Deyo, 68, on Aug. 27, 2016. She’s charged with aggravated vehicular homicide, aggravated vehicular assault, and operating a vehicle under the influence of alcohol and/or other drugs. Testimony revealed she allegedly had a .343 Blood Alcohol Concentration (BAC) shortly after the accident. Certo began presenting his case by playing a video of Dr. Steven Wunder’s testimony. Wunder said he had reviewed Smith’s 3,000-or-more pages of medical records stemming from the accident in which she suffered multiple fractures, internal bleeding, and underwent multiple surgeries. Wunder called the type of test used to take Smith’s blood alcohol concentration a “generally good rapid screening” but said it was inaccurate and prone to false positives. He claimed the test should have been repeated and a different kind of blood test should have been used. Dr. Daniel Hood, medical director of CompuNet Clinical Laboratories at Miami Valley Hospital who returned as a rebuttal witness for the prosecution, later testified that he did not consider the type of test used prone to error, nor that those tests should always be repeated. Wunder said at .2 BAC, most people have blacked out and a .45 BAC is considered fatal for most people. At .343, he said, most people are unconscious or in a coma. Wunder said EMS records did not indicate Smith had signs a person would have with that level of intoxication: loss of consciousness, slurred speech, poor coordination or vomiting. Especially with regard to alcohol levels, he said tests must be clinically correlated with the patient. Dr. Ereljorn Nelson, professor of clinical pharmacology and systems physiology and associate director of Cincinnati’s Drug and Poison Information Center, who also examined Smith’s medical records — but for the prosecution — said the type of blood test that was used on Smith is used every day in every hospital in the country. He claimed it doesn’t have the potential for false positives. “A false positive is a statement that says that what you are finding isn’t there. That’s not the case in this case,” Nelson said. Nelson testified that Smith’s 343 milligram per decilitre blood result reading actually translates to .292 BAC. He called the number “high, but not extreme,” and said he had seen a small percentage of people with that BAC. Nelson also noted that people function differently at different alcohol levels. The more tolerant of alcohol a person is, he said, the less their impairment. Testimony revealed Smith was with a friend, Bruce Taylor, before the accident. Taylor said he did not see Smith drink any alcohol and that she did not show any signs of impairment before she left his house. He did say that during his 1-2 hour nap, he wasn’t sure what she was doing. And as she was leaving, he said, he could see dark clouds approaching. The cold weather sent jurors home a little early at the end of testimony. Trial will resume 10 a.m. Jan. 31 with closing arguments and jury instructions before deliberation begins. 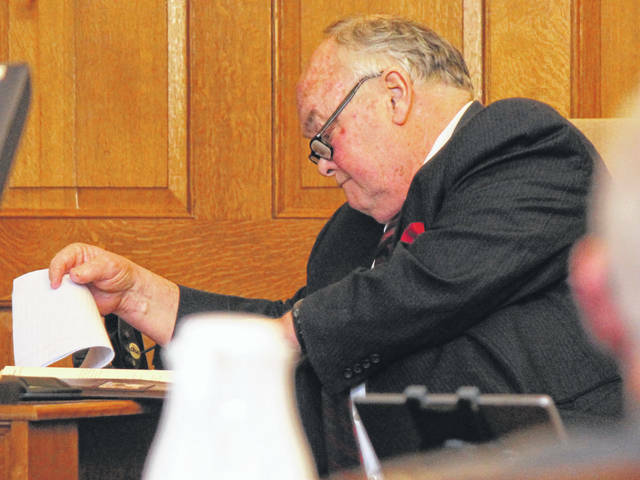 https://www.xeniagazette.com/wp-content/uploads/sites/32/2019/01/web1_Nelson.jpgAnna Bolton | Greene County News Dr. Ereljorn Nelson, professor of clinical pharmacology and systems physiology, examines records Jan. 30 during a break in testimony. 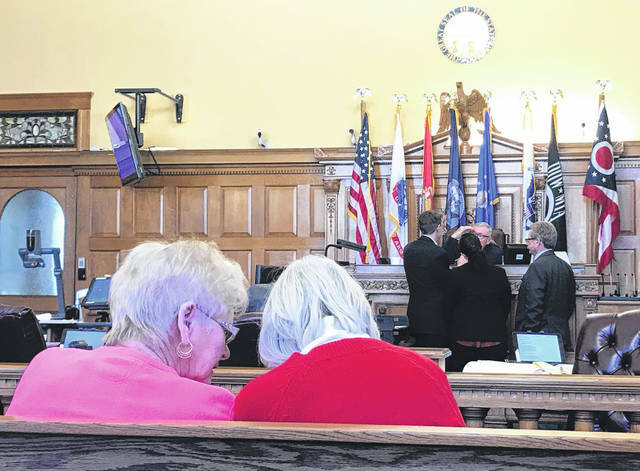 https://www.xeniagazette.com/wp-content/uploads/sites/32/2019/01/web1_women.jpgTwo women share a word as Assistant Prosecutors David Morrison and Cheri Stout and Defense Attorney Peter Certo approach Judge Stephen Wolaver during the trial.